Dr. Cushner is a board-certified orthopedic surgeon who treats conditions of the musculoskeletal system, including traumatic injuries to the upper and lower extremities, as well as sports injuries and arthritic conditions. He has completed specialty training in sports medicine and trained with advanced surgical procedures for the knee and shoulder. He received a bachelor of arts degree from Duke University and a medical degree from the University of Maryland School of Medicine. He then completed his residency training in orthopedic surgery at the Medical University of South Carolina in Charleston, SC. After his residency, Dr. Cushner completed a fellowship in sports medicine/ sports trauma at the South Lake Tahoe Orthopedic Institute in Northern California. 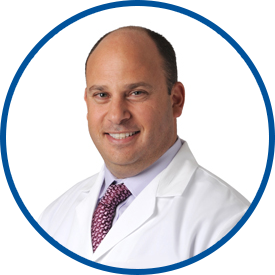 Dr. Cushner has been practicing in New York since 2001. He is a physician member of the United States Amateur Boxing Association and has served as a team physician for U.S. Snowboard Team. He works with many local sports organizations, including the Gaelic Football Association. Dr. Cushner has published articles and book chapters involving orthopedic injuries and surgical techniques. Excellent! Dr. Cushner and his colleague were great! Have been seeing Dr. Cushner for quite a long time and have always appreciated his care and attention to my medical concerns. I encountered difficulty with a prescription for pain meds at the Pharmacy. My Provider processed an immediate request on my behalf and my prescription was ready to be picked up as soon as I got home. My sincere appreciation. Dr. Kushner is very friendly and professionals well as his assistants. DR. CUSHNER IS A GREAT DOCTOR!! HE MADE ME FEEL COMFORTABLE AND AT EASE! I've been with Dr. Cushner for almost 20 years (even before WMG) so he must be doing something right. I have absolute confidence in Dr. Cushner. He is friendly, knows my record right away, remembers past conditions, and is an excellent physician. I have recommended him to many people.